Meat. MEAT. I love it, I really do. I grew up in the heart of the USA’s Midwest - the great state of Minnesota - where the basic food groups consisted of potatoes, cream of [insert mushroom, chicken, or celery here] soup, butter (or Land-O-Lakes margarine), tall cold glasses of milk with every meal and…meat. Minnesotans know what’s up. I had a recent craving for beef stroganoff. Although I ate this dish frequently as a child, I had yet to make it myself. The beef stroganoff of my youth was a retro reflection of my Norwegian-American-Lutheran upbringing - a nostalgic combination of ground beef, cream of mushroom soup, condensed beef broth, and low-fat sour cream. Although I (of course) had cream of mushroom soup in my cupboard like any good Minnesotan ex-pat, I wasn’t really feeling that version. I wanted to create something a little less…..processed. That being said, nixing the gelatinous soup schlop does NOT mean the recipe that follows is for someone watching their fat intake or cholesterol levels. This is comfort food at its finest. After making a few tweaks to the Simply Recipes version, I came up with a winner. Gather up some easy basics: butter, beef, onions, garlic, mushrooms, sour cream (be sure to read my footnote on the sour cream!). If you have tarragon, nutmeg, and Worcestershire sauce on hand, even better. First, get your beef in some sputtering, aromatic, delicious butter. 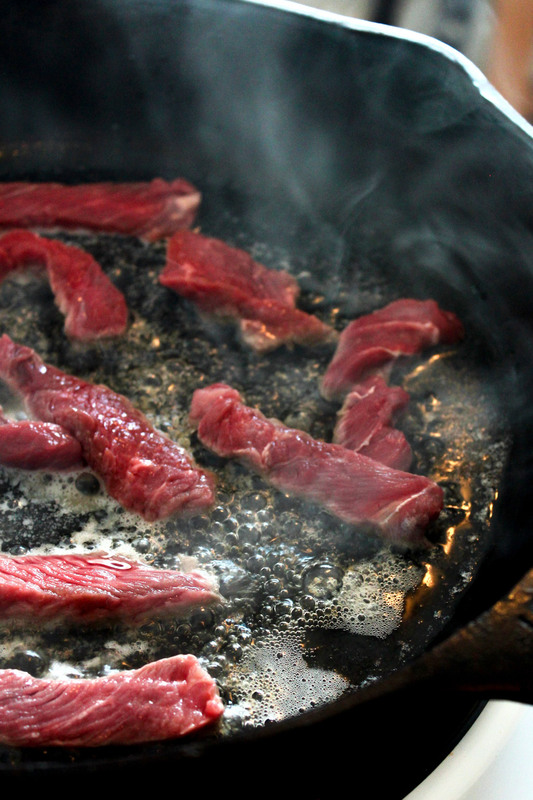 Work quickly - you’re just browning and the thinness of the meat doesn’t require much time in the pan. Set beef aside. Sauté your onions and garlic in the same pan. Let the onions/garlic rest in the beef bowl, add more butter to the pan and get those mushrooms in there. Sprinkle with some salt, pepper, nutmeg (tarragon if using), a couple dashes of Worcestershire sauce, and Minnesota-nice vibes. Deglaze with a bit of broth. I like to thicken everything up with a bit of corn starch, but that is optional. With the heat on low, add your sour cream, then add back in the onions, garlic, and beef. Give ‘er a stir and then serve over your starch of choice. I say egg noodles for the win! Top with a bit of parsley for a nice green garnish. Other than cooking your starch of choice and needing a bowl to “set aside” ingredients, this is a one-skillet dish. I found it’s best to have everything sliced, diced, and chopped from the get-go, as once you get started there isn’t a lot of down time.